Yesterday, the blog Beautiful Christian World asked a question. The question was what does John 14:6 means to you? 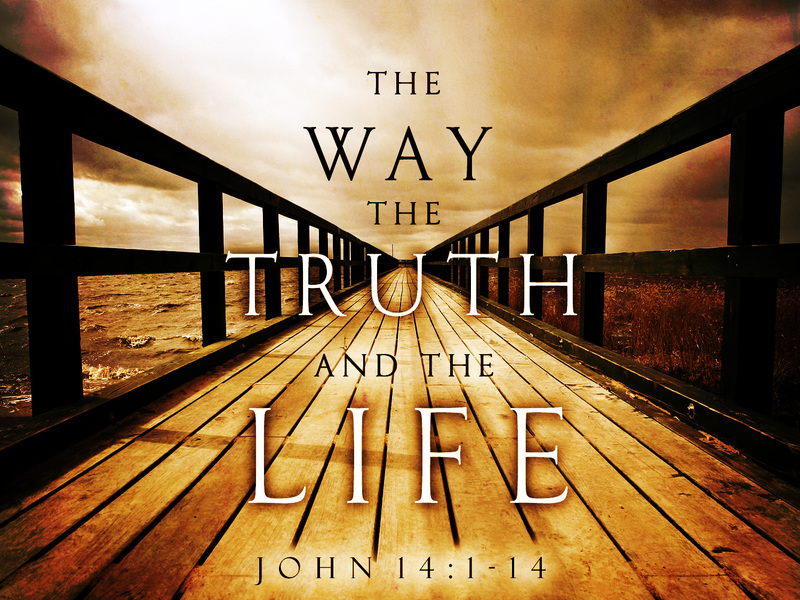 The Scripture is “Jesus said to him, ‘I am the way, the truth, and the life; no one comes to the Father but through Me. '” (NASB). Which I thought was a pretty good question and spent some time thinking on it. But instead of writing a comment on her blog, I decided to make a post about it on mine. Jesus is the one true way to God. There are no others. He says in this verse that no one come to God any other way. Many would question what exactly is the way? To me the answer comes from the crucifixion and a question Jesus asked Peter in the previous chapter, “Will you lay down your life for Me?” (John 13:38 NASB). As Christians we are called to follow Jesus, but that call can sometimes get confusing. I believe that call means to lay down our lives for Christ to do God’s Will. Jesus did that by being put on the Cross. He laid down his life for the redemptive plan of God. He may not always ask us to fully give up our lives, but I believe that we are meant to live that way. Because our life isn’t ours, it was given to us by God (Genesis 2:7). “In the beginning was the Word, and the Word was with God, and the Word was God. He was in the beginning with God. All things came into being through Him, and apart from Him nothing came into being that has come into being.” (John 1:1-3 NASB). In these opening verse of John’s gospel, he is showing that Jesus was present in the Creation. He has been with God, and is apart of God, ever since the beginning of time. When Christ came into the world, God’s message had become distorted. The Pharisees set on a seat of power, because they were using the Law in order to put everyone else down and raise themselves up. But Jesus came with his intimate knowledge of God in order to teach the truth of God’s message. Jesus proves his intimate relationship with God by saying, “Do you not believe that I am in the Father, and the Father is in Me? The words that I say to you I do not speak on My own initiative, but the Father abiding in Me does His works.” (John 14:10 NASB). I believe that this part of Jesus’ tri-fold statement is found in the next chapter. Jesus says “I am the true vine, and My Father is the vinedresser. Every branch in Me that does not bear fruit, He takes away; and every branch that bears fruit, He prunes it so that it may bear more fruit.” (John 15:1-2 NASB). (Now I know I used this Scripture yesterday for a somewhat different purpose, but Scripture has so much inside of it that any one verse can hold many truths for a varying set of circumstances.) In order to have life, we must be plugged into Christ. If we are removed we wither and die. I think of a grape vine (which I’m sure Jesus was too). If you remove the grapes before they are ripe, they will never become good fruit. In order for us to have life, we must plug ourselves into God’s vine found in Jesus. So to try to put this all together, this verse says to me that Jesus has shone me the way to God, revealed to me the truth of God’s message, and is the source of a good life. If Jesus isn’t this for you I would encourage you to spend some time in Scripture and prayer. I also spread the question to my followers. What does John 14:6 mean to you?